"As you have an interest in vintage models, here is one built from the 1/72 Revell Ki-45 Kai kit dating back to the 1970s and finished in the livery of the 3rd Chutai, 53rd Sentai based in Matsudo in December 1944. This subject is well documented by pictures in various books, in particular the original FAOW 26. 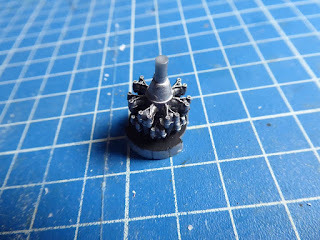 I took the box out of the stash to participate in a group build on an Italian forum. The build was dedicated to an old friend who passed away earlier this year and is well known in the Italian community. 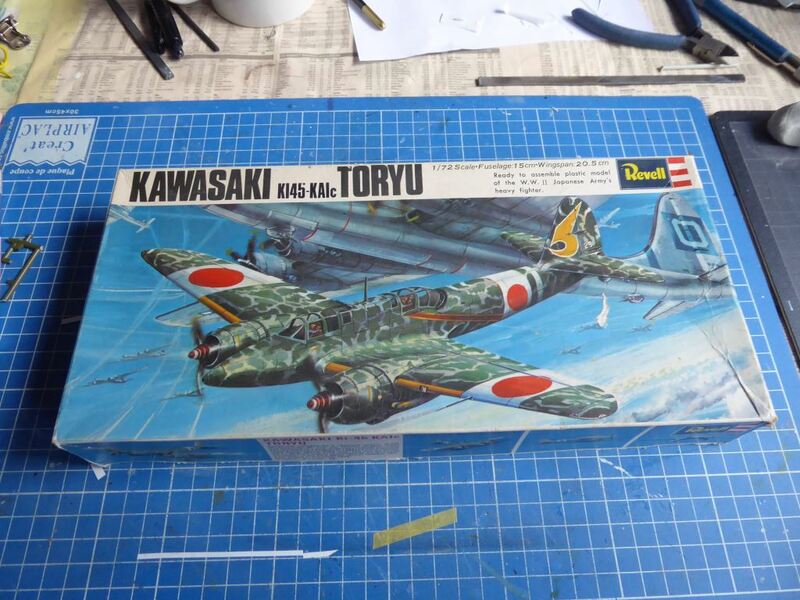 I had the occasion of knowing him well when we were both kids during the early seventies, and at the time we could only look at boxes like this one as we couldn't easily afford them with our pocket money: for one of them we could buy three Airfix bagged kits! 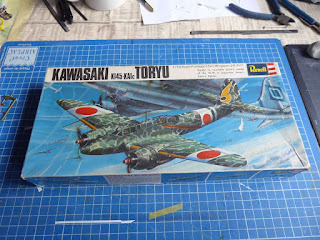 The group build was entitled "Non é roba per cocchi di mamma" which can be loosely translated from the Roman dialect as "Not something made for mommy's boys" - an expression he often used to describe kits requiring some work compared to current major releases. All considered I though this kit was a proper tribute to him in all senses. 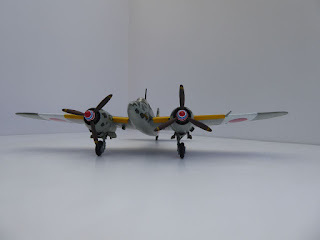 "Before opening the box I was considering how best to re-scribe the kit but on seeing the contents I was pleasantly surprised - the surface detail was already with a mixture of very fine recessed lines and rivets with some raised detail, even in the brittle plastic of the time. The level of detail was well above how I had remembered, even with some cockpit raised details. The interior is more than sufficient given the fact that all is pretty much invisible at the end. 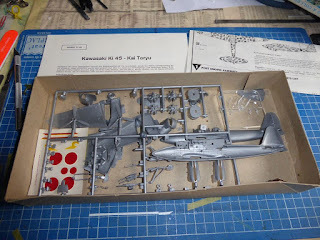 The kit also contained parts to modify the nose and make the version with the projecting nose cannon, but I went for the oblique armament of number "25" that was well documented. 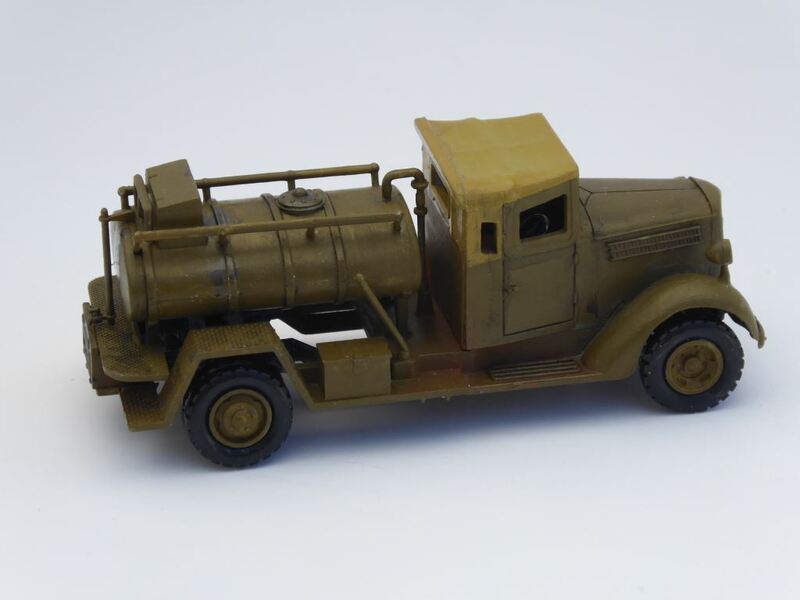 A bit of internet research provided suggestions for the different colours for the interior and I went with the suggestion of an olive drab interior. 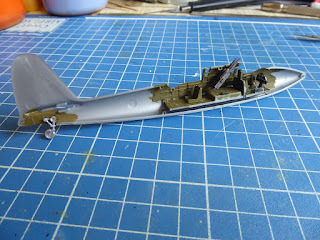 "All went well with construction of the fuselage so I moved on to the wings. 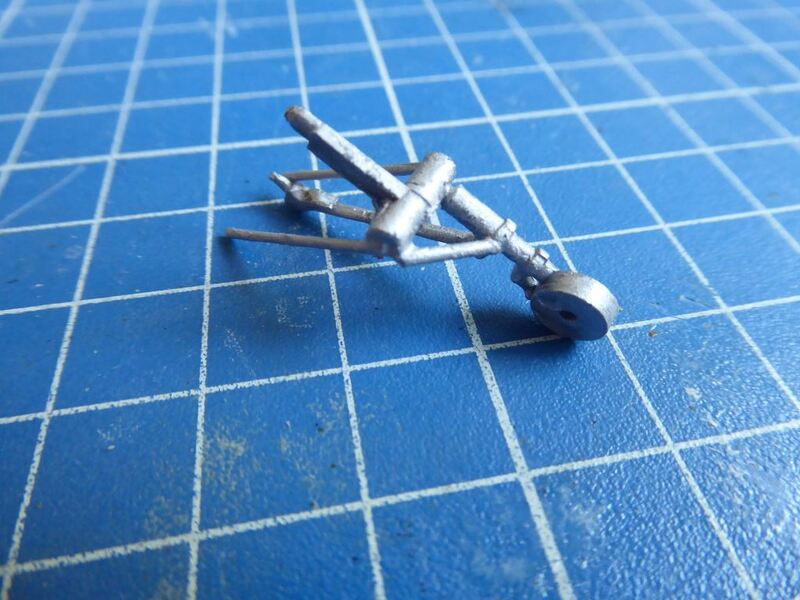 On checking the design I realised that the landing gear was totally wrong. 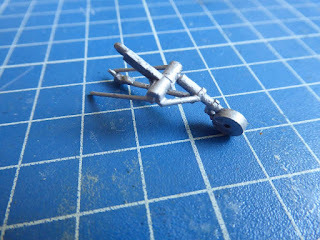 Fortunately the modification was not very difficult and consisted of cutting and repositioning the wheel strut, adding an additional diagonal strut as reinforcement (from plastic rod) and two long struts totally missing in the kit (from metal rod). Far from perfect but afterwards better resembling the original (and somehow more robust than at first). "The only areas needing some putty were the cowlings and their attachments. The engines are detailed enough given what is visible and the option is provided to leave a cowling panel open as it os a separate piece. Once the fuselage, wings and tailplanes were assembled, I moved onto airbrushing the entire surface with Gunze Sangyo H62 (Ed: IJA Gray - this paint is now described in Japanese by Gunze as "light grey white colour" 明灰白色). Once dry I masked off the camouflage reticulations with watercolour masking fluid, easier to control than the modelling masking fluids, and airbrushed H60 (Ed: IJA Green, now described as both Deep and Dark Green Colour 濃緑色/暗緑色). 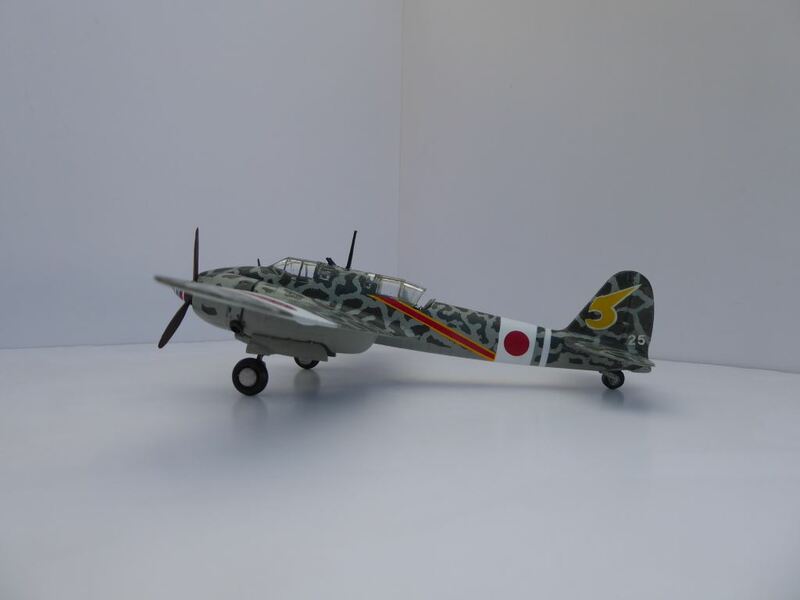 Once the masking was removed, some people on the Italian forum in friendly fashion made me notice that the distribution and shape didn't look right. Looking carefully I realised that they were right and so I touched-up both colours by brush. 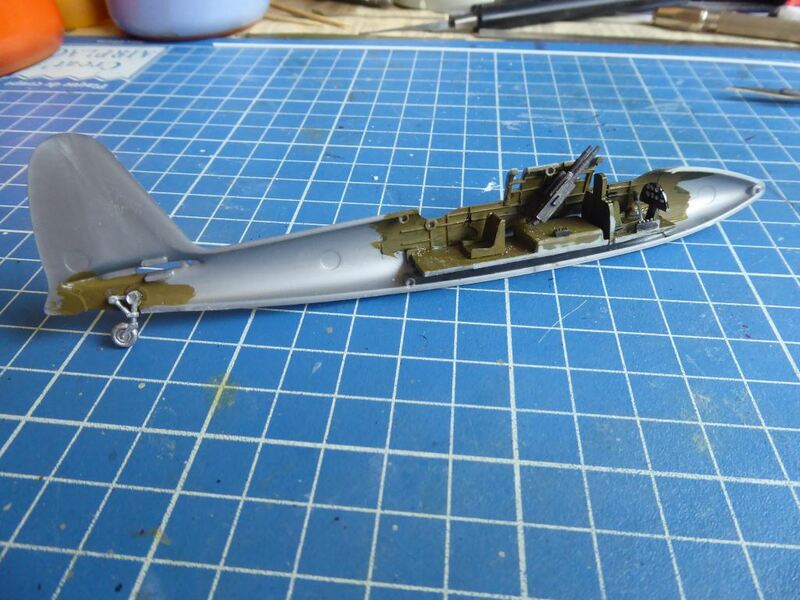 Once satisfied I proceeded to mask for the white Homeland Defence "bandages" and the diagonal fuselage stripe. 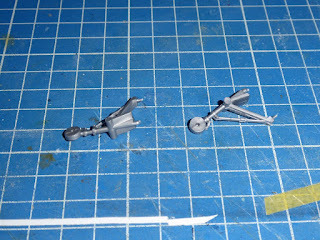 I airbrushed Gunze H1 (white) and once that had dried I applied yellow H4 and lastly the red H23 (in my experience yellow and red always need a white base coat to come out right). "Time for the decals. Not trusting those from the kit I used spares for the Hinomaru, but I had no choice for the Sentai insignia and the white "25" so I applied a good coating of Microscale liquid decal film on them. Even so they broke into two and three pieces anyway, but finally they were more or less in place with just a bit of brushed on yellow in a couple of places. "At this point I remembered I had also a (Hasegawa) Isuzu fuel truck in the stash, practically from the same era as the Toryu kit. So I took it out and quickly built and weathered it. I then finished the aircraft with the propellers and the spinner stripes that were brushed on free hand (I gave up on using fine masking tape after a few tries). Lastly I attached the wheels. 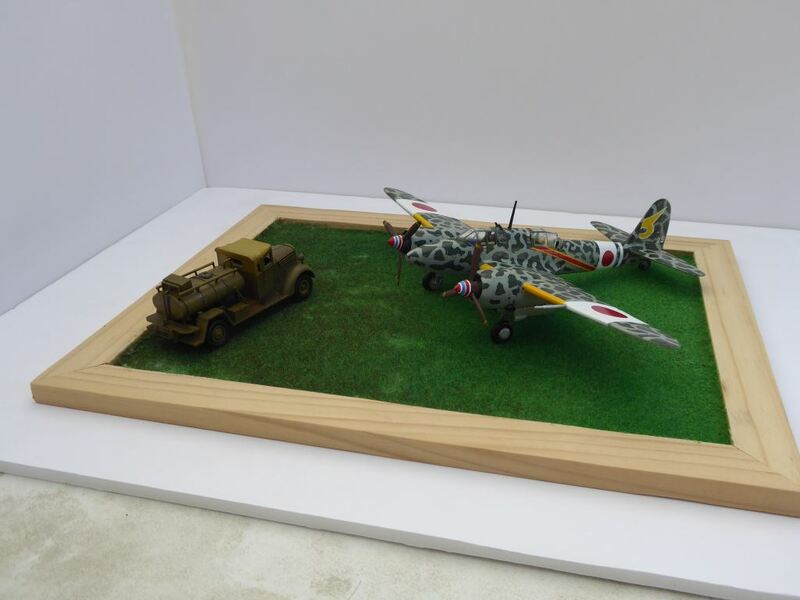 After taking some pictures, both models were placed in a diorama-like presentation using an all purpose grass base (maybe not very Japanese!). "I was reasonably satisfied. 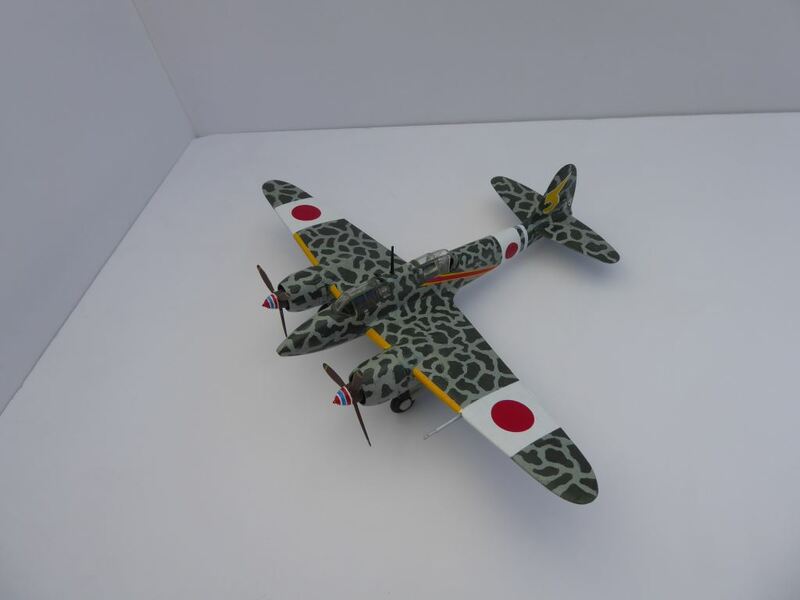 Clearly not a contest winner (and not my style those, I am just an average modeller) but I very much like the overall look especially if I consider it as I would have done at the time of the kit's release - if only someone had offered it to me. I think Pino would have agreed." With special thanks to Carlo for sharing this and the trip down memory lane. And a great job on those challenging spinner stripes too! 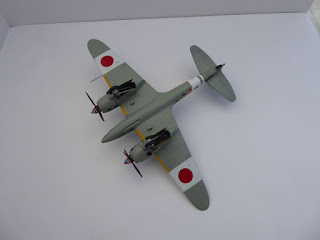 Regarding the undercarriage construction I had the same experience with my 1/48 Toryu (Feb 2016 blog) because neither the Nichimo nor the Hasegawa kit have got it right. You did very well. It's wonderful to see older kits get built and look so nice. Thanks for sharing! Carlo, you have proven that this is *still* a good kit, and my first thought was the same as Nick's - those prop spinners look great! Nice job! Thank you all for your kind words. I showed it just as I would do at my local club and I am pleased that the atmosphere here is as good as there. 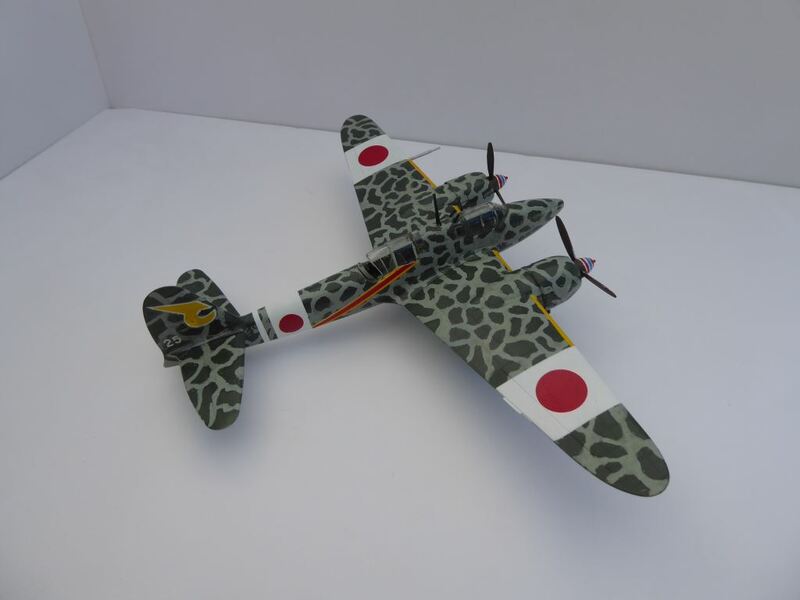 The kit is certainly still very good and better modellers (as some of you are) can really make it as good as a contemporary one. The engines are very good and one can use the breakdown of parts to show the interiors (nose or engine or oblique cannons). 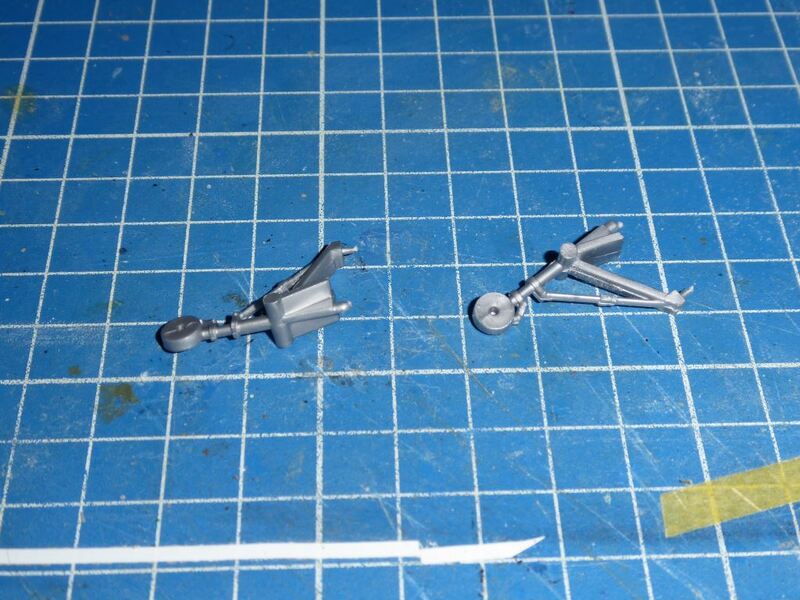 The intervantion on the landing gear is straightforward once you get over the saw-phobia and learned how to do pegs. In the end is actually more solid.